Acer Aspire S7 is one of the premium models from the vendor and just by looking at it, it’s almost impossible not to appeal to you. Today we are going to review the updated model, which has the same looks as last year’s generation, but at the same time features a lot of improvements in terms of hardware. 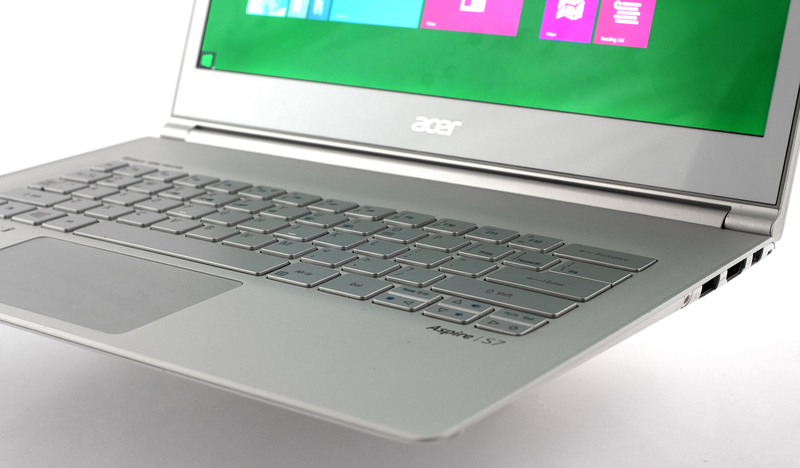 Also, the Aspire S7 has some other tricks up its sleeve and useful design tweaks over 2014’s model. For starters, the ultrabook has some great looks, built with precision and high-quality materials, but despite its compact design, this ultrabook has the powerful Core i7-5500U CPU with Intel HD 5500 Graphics, which quite oddly, scores a lot better than the integrated Intel graphics from this generation we’ve tested so far. But more on that in the CPU and GPU section. Also, for the given price the Aspire S7 brings a lot more to the table than most of its competitors with the QHD screen and touch capabilities. For instance, the direct competitor from Dell – the XPS 13, offers incomparable hardware for a higher price. We will look into that more in the following review. Before we begin, we strongly recommend that you watch this short, but informative video review by Georgi Dobrikov. 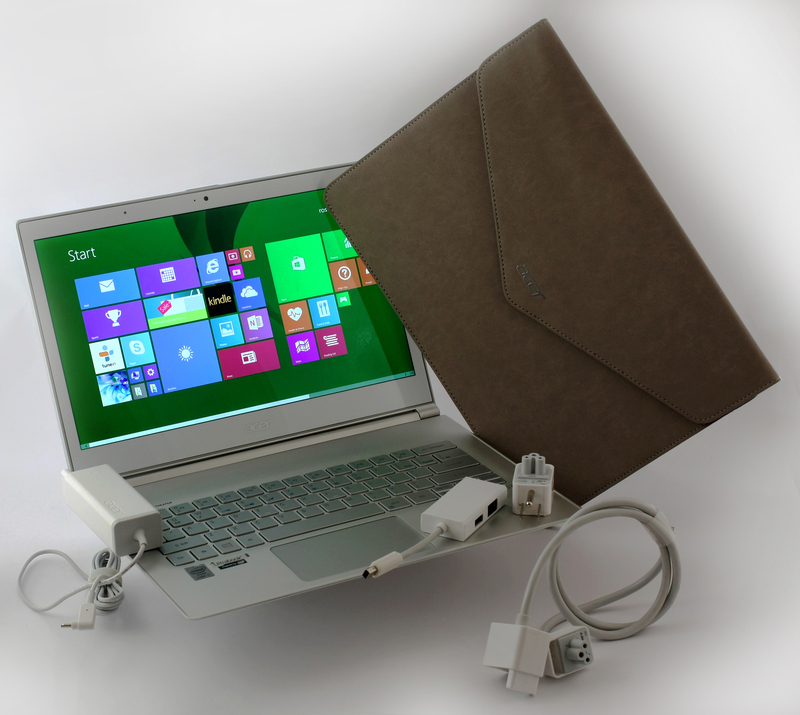 Unlike most notebooks, the Aspire S7 ships with several useful accessories that can prove useful to most users. Leaving aside the usual AC charging cable, DVD for drivers, and user manuals, the S7’s box contains an extension cord to the usual AC charging cable when you need the extra length. You will also find an additional adapter that can be used with what appears to be a ThunderBolt port or as Acer likes to call it – Acer Converter port. This adapter consist of a box-like device with VGA port, USB 2.0 port, and LAN port. This a really useful gadget if you need a VGA connector or a Wi-Fi connection isn’t an option. Also, the box contains a wonderful bag for the machine that’s pleasant to touch, it’s elegant and has the Acer’s logo, of course. As we mentioned earlier, the S7 has an incredibly thin profile and premium overall looks. If things need to get technical, the height of the ultrabook is just 12.7 mm and the weight is approximately 1.3 kg, pretty compact and lightweight, right? Interestingly, though, it doesn’t give the impression of a super-light ultrabook and we can’t really put a finger on why is that. Let’s start with the lid that’s almost entirely covered in glass, but not just any glass – Acer has used Gorilla Glass 2 for the construction and the edges of the lid are made of anodized metallic aluminum. Those edges are really sharp and give the impression that they are cut to precision and we really liked that finishing touch. It gives a distinguished looks of the device. 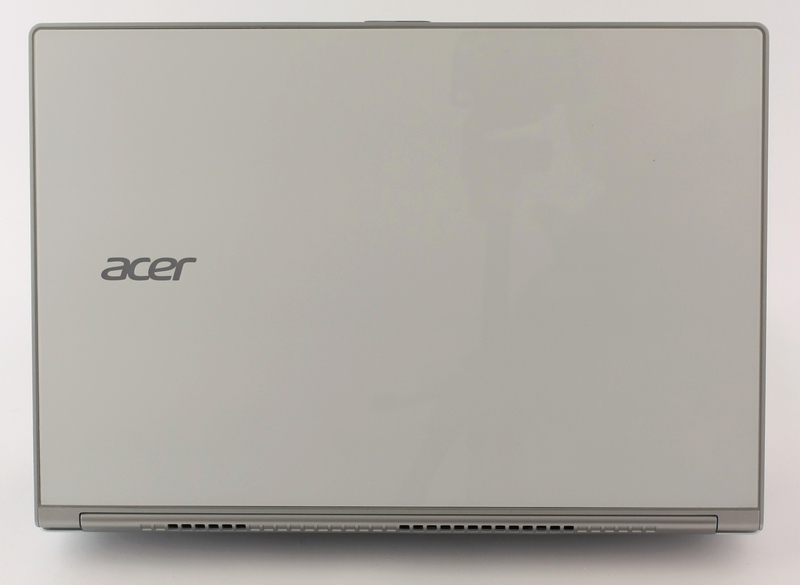 Along with all of that, Acer has put its logo on the usual place, but this time its backlit with a LED, so whenever you are using your laptop, the logo lights up. When viewed in a relatively light room, the logo has a strange purple tint, but it looks really cool, nonetheless. The hinge is the other thing that deserves the extra attention. Acer boasts with this simple, yet effective feature. The designers attached the display directly to the display frame instead of just screwing on the top of the cover. This adds some extra stiffness and the display doesn’t wiggle as much. 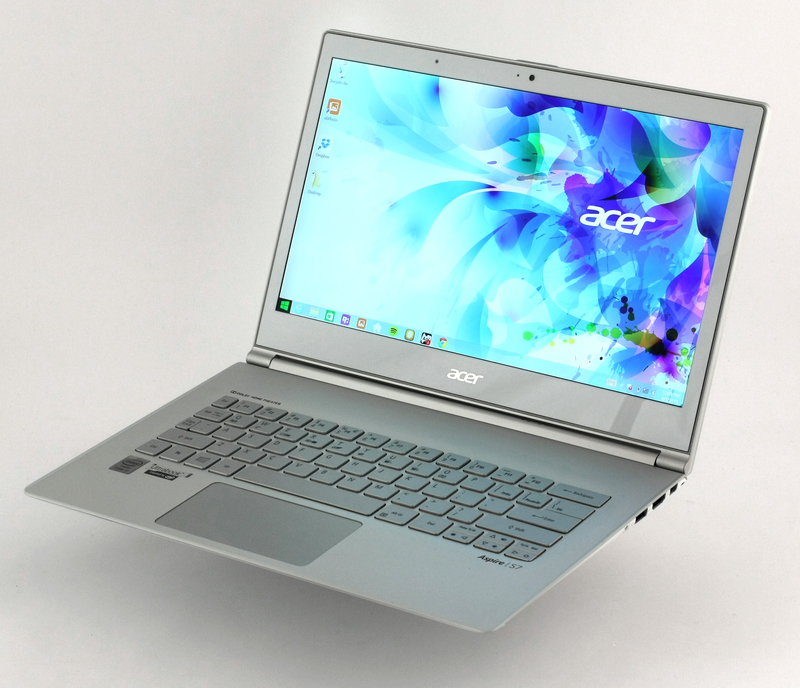 Sounds really simple and an addition to that is Acer has included the so-called Dual-Torque Hinge Design. What this feature basically does is increasing the force you have to apply when opening the lid after a certain angle. In our case, the hinge is easily opened until 105° and after that you will have to apply almost twice the weight to open it further. To be exact, the pressure needed until 105° is 3.3 kgf-cm and after this angle – 6 kgf-cm. This technique is used to reduce the wobbling effect when using the touch screen and in practice it’s greatly reduced, but not entirely. Still better than most notebooks we’ve used so far, so we really have to give credit to the designers – great thinking. The full extent of the lid is 180° and you can easily flip the screen using the “Fn + O” key combination, which can prove useful when presenting visual content to a person sitting in front of you. The bottom of the casing, however, doesn’t offer the same premium build quality that’s introduced with the top lid. The bottom cover is made of plastic that’s glossy and matte at the same time or something in-between. It feels a bit cheap, but it does provide fairly easy access to the internals. Along with the 11 screws, you will find the main grills for dispersing the heat and two grills for the sound coming from the loudspeakers. Interesting placement, though. We can expect them to sound a bit muffled since they are placed on the bottom of the ultrabook. Continuing on with the sides of the Aspire S7, which are crafted with anodized aluminum and designed with sharp edges. On the left can be found the DC charging port, the power button (interesting placement), one USB 3.0 port and the SD card reader. The right side accommodates the so-called Acer Converter port, HDMI 1.4, USB 3.0 and combo jack for 3.5 mm cable. On the front end of the machine are placed two microphones and we are going to talk about that later on in the review. 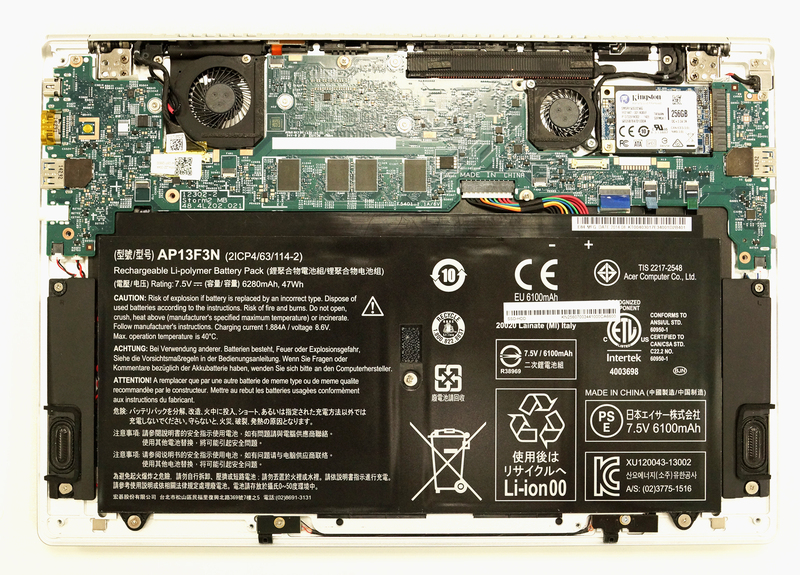 The back of the ultrabook has the usual LED status light that can be easily seen when the lid is closed or opened. Also, there are two big vents for the cooling system and, unfortunately, they are made of plastic. This cannot be easily determined since Acer used just the right color for the aluminum frame and the plastic piece. The interior of the Aspire S7 feels even more premium than the exterior. It has the same aluminum signature design all around the keyboard without any “distractions” making it simple and minimalistic. The keyboard feels good with a few drawbacks. Firstly, the keys feel a bit stiff, but on the contrary – they offer quite a bit of travel. Compared to the old S7 series, this one has 0.3 mm more traveling distance than the previous generation (1.0 mm for the old series and 1.3 mm for the new one). 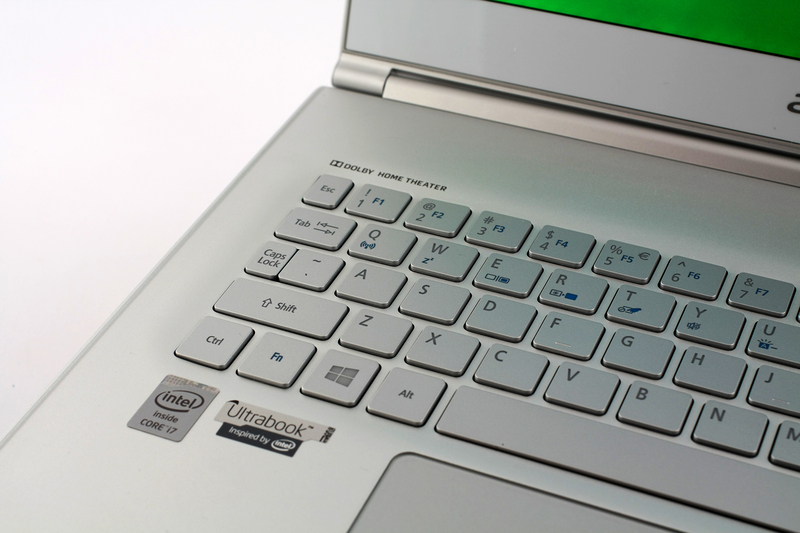 Secondly, the keyboard is too close to the touchpad to our taste. This one really depends on each individual user, but it’s easy to accidentally touch the touchpad when typing and you might experience a lack of palm support when typing – this will be noticed mostly by users with bigger hands. Also, the “Caps Lock” key is smaller to compensate for the “~”, but this is way better than reducing the size of the “Shift” key like most vendors do. The row with the “F” keys is also missing, so you will have to use the “Fn” key and the numbers to use them. Despite all that, as expensive as this device you would expect an LED backlit keyboard. Well, you have this functionality of your dispolsal with a few tweaks. 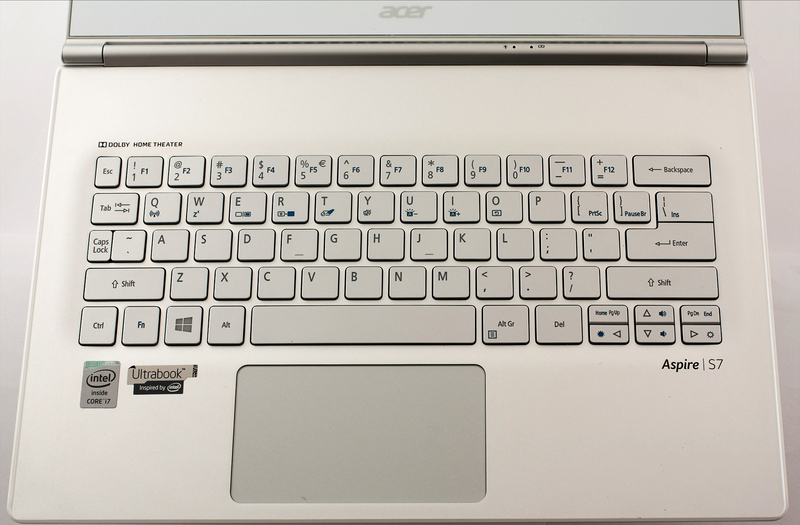 Acer didn’t use the conventional LED technology to light its keyboard but an EL (electroluminiscent) backlight that provides better light distribuation, thus better typing experience. Quite frankly, we didn’t find anything more special than the conventional LED technology. However, the keyboard also uses a built-in light sensor that adjust the EL light according to the conditions. The same sensor is used to adjust the screen brightness and it’s located on the top of the lid, just above the 13.3-inch screen. Speaking of the touchpad, this one we liked the most. It’s comfy, easy to use, pleasent in touch, and responsive. It also provides tactile feedback when using the left and right mouse buttons and the size of the usable area is just right. To sum thing up, the Acer Aspire S7 ultrabook has an astonoshing and quality build design with just few neglectable drawbacks that most users will not notice. Port placement could be better (it seems that Acer loves to put ports on the right side of their laptops) and the bottom of the machine somehow stands out with its plastic cover. Nevertheless, the S7 feels really sturdy, compact and really pleasent to work with. 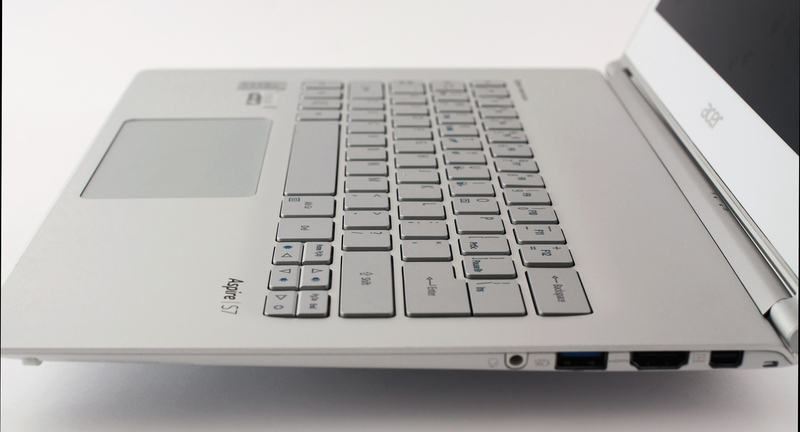 The Aspire S7 offers really easy access to the internals. Only a few screws are needed to be removed so probably you will not have any trouble removing it. For more information, you can visit this page explaining the internals. 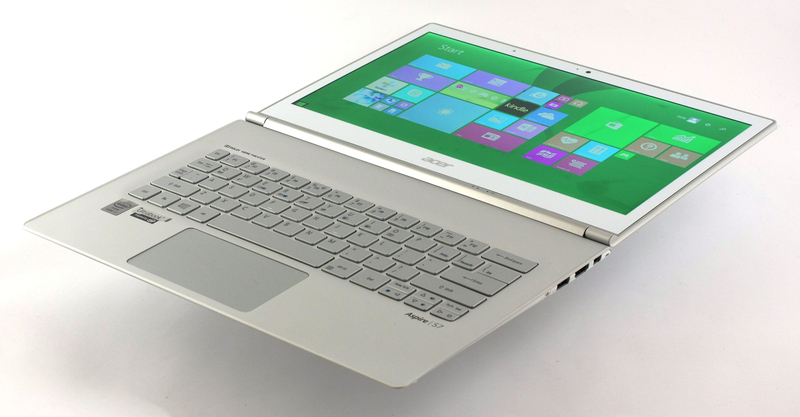 The Aspire S7 implements a relatively new technology of the LCD screen called IGZO. IGZO differs from the conventional screens due to the materials used in it – indium, gallium, zinc and oxide (IGZO). It replaces the usual silicon material, so the IGZO technology is used to deliver better semiconductor properties. It’s invented by professor Hosono in his laboratory located in the Tokyo institute of technology and Japan Science and Technology Agency. Until now, the liquid crystals inside the displays were managed by thin-film transistors (TFT) based on silicon (a-Si), but here is where the IGZO shines. The IGZO transistors are a lot smaller and offer better energy efficiency and at the same time provide better touch-sensitivity. The end result is better screen quality (due to the pixel count), greatly reduced power consumption and improved touch-sensitivity. Usually the power consumption is rated at around 1.5W. However, the one used in the Aspire S7 is manufactured by Sharp with Quad-HD resolution (2560×1440) with model number LQ133T1JW02. Its diagonal is 13.3″ making the display with a pixel density of 221 PPI and space between each pixel – 0.115 x 0.115 mm. The surface is glossy with an anti-reflective finish. The display turns into “Retina” if viewed from 41 cm. You can see the panel viewed under a microscope on a white background. And here is the quality of the image viewed under 45-degree angle. The maximum brightness we were able to record is 359 cd/m2 with a deviation of only 9%. Its native color temperature is 6461K and aligns with the optimal one of 6500K (D65). Acer Aspire S7’s display covers 97% of the sRGB and 74% of the Adobe RGB color gamut. WEB-based (sRGB) colors will be missing only a small portion of the red color. The tone response curve (gamma) has no significant deviation from the optimal one. We calibrated the display at 200 cd/m2 (49%) brightness and its native color temperature. The measured contrast was 1340:1. After the calibration, we measured the color reproduction which showed that 90% of the colors were reproduced accurately and even photo or video editing specialist will not notice the deviation. The deltaE(76) equals 1.01. We did the same thing with another calibrator, but before that we measured the DeltaE with its stock calibration. After we created a different profile in the Windows directory, results were again really good. You can see the results on the color map below, but it’s really hard to tell the difference, mainly because you are most probably reading this review on a display with not so accurate color reproduction. 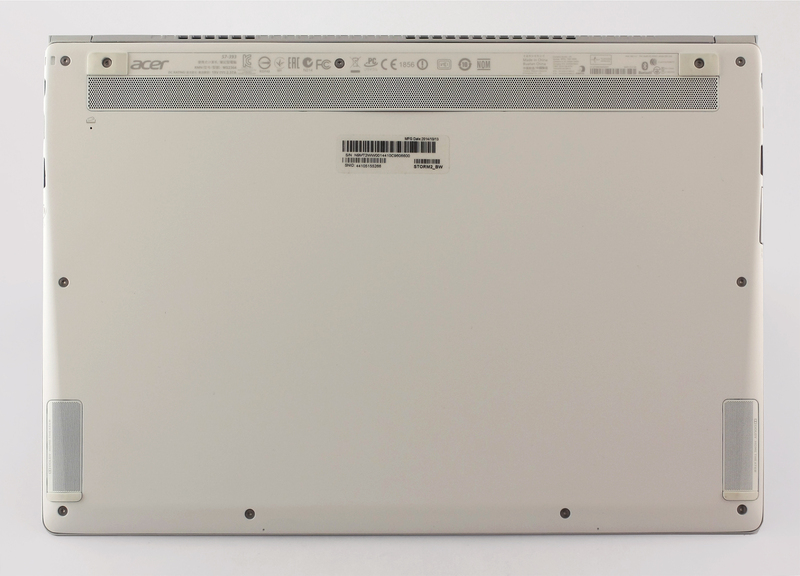 Acer Aspire S7’s display uses PWM to control the backlight of the panel and screen flickering occurs only at low levels of brightness. PWM is absent also at 120 cd/m2 making this display usable at all most commonly used brightness levels. We are now testing each screen to check its gaming properties. On the graph below, you will see the results from our tests, measuring the response time of the pixels from black to white and white to black at 10 and 90%. Usually, the manufacturer of the panel lists these properties. We measured the Fall Time + Rise Time = 27ms which is almost 3 times slower than most TN panels, which is why a lot of gaming machines still use the TN panel. The consumer must choose between better display quality or fast response time. Acer Aspire S7’s display has some great properties that cannot be found not most notebooks in its class. It has high QHD resolution, high contrast ratio, good viewing angles and accurate color reproduction. It is also user-friendly in terms of usability as screen flickering doesn’t occur in most of the brightness levels. This is not surprising after all, since Sharp is capable of manufacturing quality IPS panels. Excellent result, considering the QHD screen – 377 minutes (6 hours and 17 minutes). A bit lower result, but still similar to the “Web browsing” – 307 minutes (5 hours and 7 minutes). Outstanding result if we take into account the nature of this demanding test – 172 minutes (2 hours and 52 minutes). We are fully aware that the Aspire S7 is not intended for gaming, but we ran the test just for comparison and evaluation reasons. We’ve ran the usual torture tests for the CPU on the new Aspire S7 notebook and see how it handles the extra load and heat. The CPU load is set to 100% for about an hour and the whole point of this is to check the system stability in the long run. At first the CPU reached its maximum operating freuqency – 2.9GHz (for two active cores). 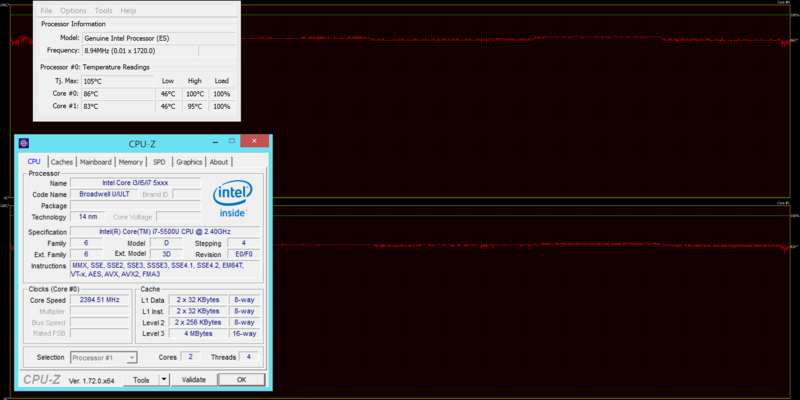 After a few minutes the CPU droped at 2.4GHz which is the base clock. At first the temperatures rose at 100°C, which is close to the maximum operating temperature of 105°C, but shortly after the CPUs fan cooled down the chip to the much more acceptable 84-86°C. Also, the fan appears to be quite silent, but more on that later. You can see the CPU load (green line) and the temperature of the cores (red line) on the graph below. After an hour of CPU torture test, we’ve included the GPU torture test to see how the chip will handle the extra load of the integrated GPU and the CPU cores. Temperatures didnt’t rise at all, but most imprtantly – we didn’t notice any throttling at all. This is one of the few laptops we’ve tested that doesn’t reduce the operating frequency when we have two active cores running and the GPU at maximum load. The CPU maintained 2.4GHz clock throughout the whole test and this can be considered as an excellent result and you can see the graphs below. However, it’s important to keep in mind that theese torture tests do not represent real-life conditions and it’s almost impossible to reproduce 100% CPU + GPU load when working on a daily basis. Again, we run these tests to check the overall stability of the hardware and see how the internal heat affects user experience, which can be seen on the heat map below. Now we understand why Acer has moved the keyboard closed to the touchpad. The top area of the chassis got quite hot (and the aluminum designed helped a lot for the hot feeling), which is normal, since the CPU is located right beneath. That being said, we can consider the cooling system almost flawless, because the area where palms rest remained cool, so you will not feel any discomfort when typing and working. Also, we need to take into account the so-called Acer TwinAir Cooling system. Basically, the new fan runs with less blades (29 blades for the first generation and 23 for the second one) and aims to reduce the noise of the fan while keeping the good performance. While this simple modification promises a lot, the noise wasn’t reduced as much, but we did notice less noise than most competitors in this class (the new XPS 13 for instance). The screen quality is the thing that steals the cake. 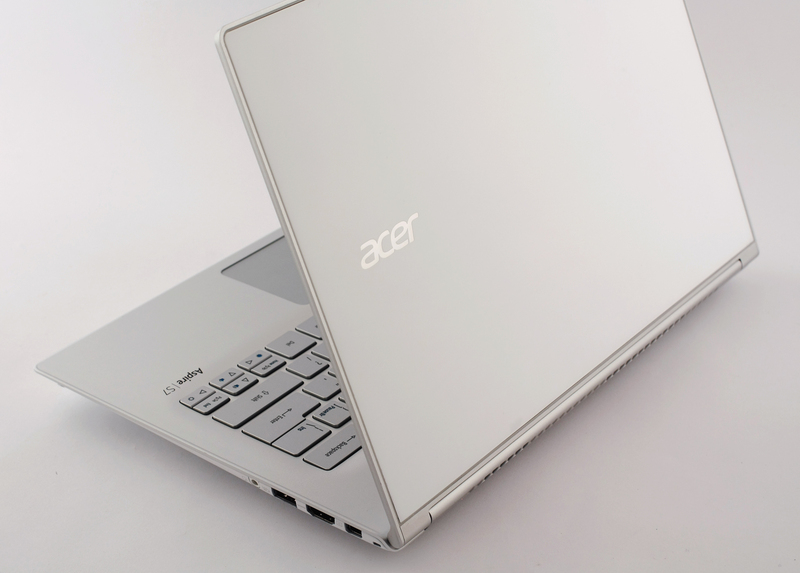 With the new IGZO technology, Acer was able to build an ultrabook that’s good even for photo editing. You’ve got great screen properties at your disposal – high brightness, high contrast ratio, excellent color reproduction, and no PWM was recorded at most levels of brightness. On top of that, you’ve got yourself an incredibly low power consumption from the panel, despite its pixel density of 221 PPI and QHD (2560×1440) resolution. And that is easily seen on the battery tests. Quite frankly, it’s almost impossible to find any major flaw of this product and the only thing that comes to mind is the mSATA SSD. It would have been perfect if the Aspire S7 used m.2 SATA, but what more could you ask for the price? could you please tell me how fast the LAN support via the Acer Converter port is? Is there a quite significant lower speed in surfing? I couldn’t find any info in the test. I’d be glad if you check this and give some feedback, thanks. Brilliant Review! Please could you email me your screen calibration file?